Making News or Breaking News! Is Virginia’s Political Circus Ready for Another Ring? Perriello: Hi Ralph, Tom Perriello here. Merry Christmas and Happy New Year! Northam: Same to you! I’d love to have you come to my big fundraiser headlined by Governor McAuliffe on Saturday night! Can you make it? Perriello: No Ralph, I’m busy. I have my own fundraiser scheduled. I’m running for governor. Northam: In 2021? Wow, that’s great planning! Very impressive! Perriello: Uh, no Ralph. I’m running against you in June. Northam: [Silence]. Well Merry freaking Christmas. Regardless of whom you may support, Perriello and his team — starting with Democratic consultant Don Mark — brilliantly executed this political bomb. It has to go down as one of the most effective non-announcements in Virginia political history. First, it’s been the best-kept secret in Virginia politics. Knowing this landscape as I do, if a politico so much as goes to the bathroom one too many times, the state’s bevvy of bloggers manages to pick it up. Leaks are commonplace. Nothing is sacred. So this announcement took the entire state’s insiders by surprise. No one I talked to saw it coming. Second, Perriello announces it by first calling Northam personally. Another stellar political move. Third, the former one-term U.S. House Rep. from Virginia’s 5th congressional district does it a mere five days prior to the start of the 2017 Virginia General Assembly. Northam, as Lt. governor, can’t fund-raise and he’s essentially campaign handcuffed for 60 days while he has to preside over the state senate, stuck in Richmond with gavel in hand. Meanwhile, Perriello has two months of free reign where he can play short-term catch up. This campaign launch should be taught at UVA’s Sorensen Institute for Political Leadership. In fact, it should merit its own chapter in their textbook. We even have the title: “How to undermine the entire Democratic establishment, the DPV, their big donors and the incumbent governor in all one fell swoop” – by Tom Perriello. Perriello presents a host of challenges for the one time inevitability of the Northam for governor juggernaut. He is a darling of the Democrats’ progressive wing of the Party, as he stood heroically by President Barack Obama’s agenda during his one House term in Washington. 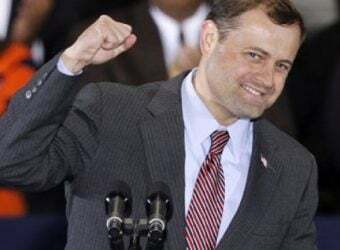 Throwing caution to the wind after ousting incumbent conservative icon Virgil Goode in the 2008 Obama election wave, Perriello backed Obama’s every policy initiative with fearless vigor while representing a historically Republican district in central and south side Virginia. He never wavered, and became an Obama favorite. As a result, Perriello was subsequently defeated by GOP challenger Robert Hurt in the Tea Party election of 2010, helping Republicans to take back control of the House. Perriello is likely to energize the more progressive non-establishment wing of the Virginia Democratic Party. They’ve been itching for a fight. While Bernie Sanders got pummeled by Hillary Clinton in the Super Tuesday Democrat primary last March, its hard to gauge how much of the center-left Democratic primary coalition vote will be locked in for Northam come June 13. Northam came from behind in the 2013 Democratic primary to knock off one-time team Obama Chief Technology Officer Aneesh Chopra, who served as an Assistant to the President and Associate Director for Technology in the West Wing. Chopra turned out to be a weaker candidate than many of his progressive supporters had hoped. Sometimes standoffish, and not personally engaging, Chopra ran without name recognition and laid claim to no inherent base. Perriello has none of these flaws. He has strengths in key areas where Chopra showed weakness. The former state senator from the Eastern Shore and Norfolk also benefited in 2013 from some Republicans, Independents and moderates crossing over to vote in a Democratic primary for Northam – or against Chopra. The Republicans nominated their candidates by way of a statewide convention in May, so they had nothing going on in the June primary. When the GOP nominated Bishop E.W. Jackson for LG, some Republicans who could not support Jackson saw Northam and as acceptable alternative, in lieu of Chopra. I know this for a fact. I led “Republicans for Northam” in the 2013 June Democratic primary. Northam will not have the luxury of those disaffected open primary voters this go around. Republicans have a hotly contested primary election on the same day and they will be otherwise pre-occupied. So Northam has to win with only Democrat primary voters. The Lt. governor has very few enemies. He has raised a lot of money, and I’m told by sources close to Northam that their candidate has locked in the support of the entire Democratic General Assembly, as well as Governor Terry McAuliffe and his political big money friends. Several Democrat state senate caucus members I talked to expressed their displeasure with Perriello’s candidacy. Northam is the early chalk for sure, but Perriello is not to be taken lightly. This has the trappings of a dogfight. DISCLAIMER, 2018: For Personal/Office Use Only. Official White House Photo by Shealah Craighead.